The Real Estate numbers for December 2018 VS December 2017! 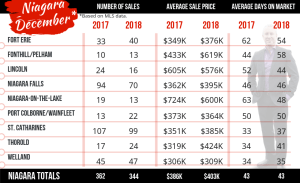 What do these Real Estate numbers tell us? There was still a bit of an increase in the residential average sale price, approximately 4.4% compared to December 2017. The average days that listings are on the market have remained exactly the same while the number of sales has gone down 5 %. The stability of an balanced market continues all the way up to the end of the 2018 year. As always, any questions, don’t hesitate to ask! Can’t see the numbers properly? Click on the image to see it full size!